dailydelicious: Blanc Disclosure: Cheese Mousse with Mixed Berries, Blueberry cheese pie comes alive again. 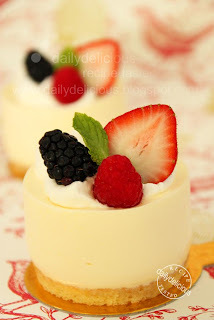 Blanc Disclosure: Cheese Mousse with Mixed Berries, Blueberry cheese pie comes alive again. When I was little, blueberry cheese pie was my favorite dessert and I wandered "is it hard to make?". And it became one of my early desserts that I could make. 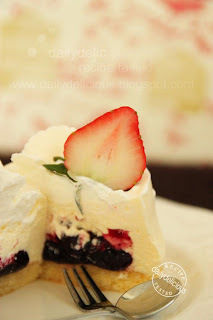 When the time passed, baking is still my beloved hobby, but blueberry cheese pie is something that I rarely make. There's nothing wrong with it, and I still love it ^^, the only problem is making the same thing again and again makes me bored, haha. I think about it and rally want to find the way to make it more interesting, and lovelier. So this time, I turn the simple dessert into something cute, the blueberry compote is not on top of the cheese mixture but inside, and fresh mixed berries make the dessert more refreshing. The method is not hard to follow but the result is different from the original blueberry cheese pie. 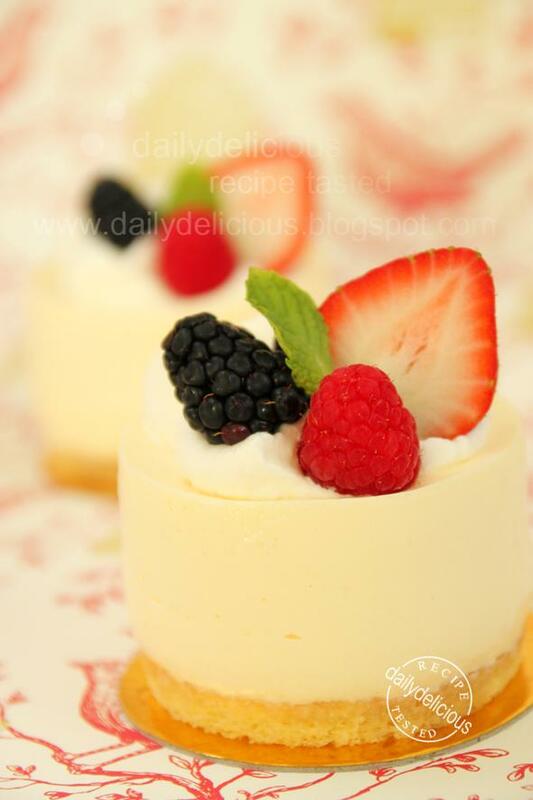 You will see white and soft cheese mousse on the outside but when cut through the mousse the jewel like blueberry compote is waiting for you inside. The biscuit crumbs are out of the way, and the soft sponge cake is here to give you soft and light feeling. I can tell you that I really love it ^^ the mousse is not too sweet and goes very well with the taste of the blueberry compote and fresh berry. Turning the simple thing into something special is fun, well, I know that you will agree with me when you taste this dessert too. Bloom the gelatin sheet in cold water. Mix 110g of blueberry with lemon juice, lemon zest and sugar in sauce pan and bring to boil until they are soften (3-4 minutes). Take of the heat and puree until smooth and pass the mixture through a fine sieve. Put the soften gelatin sheet in the hot mixture and stir in the rest of the blueberry, let the mixture cool completely. 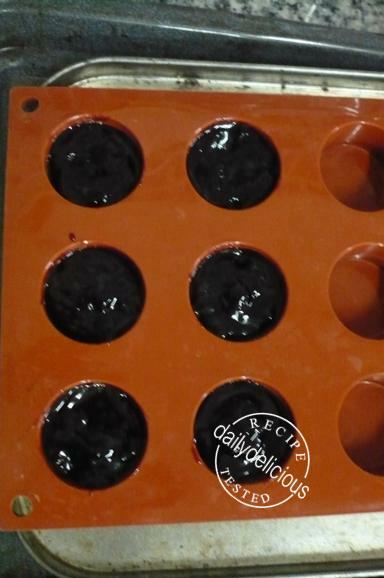 Pour the compote into 4 cm x2cm silicone mold and freeze until firm (4-6 hours). Cut the sponge into 6 (7 cm) rounds. Mix the simple syrup and creme de cassis together. 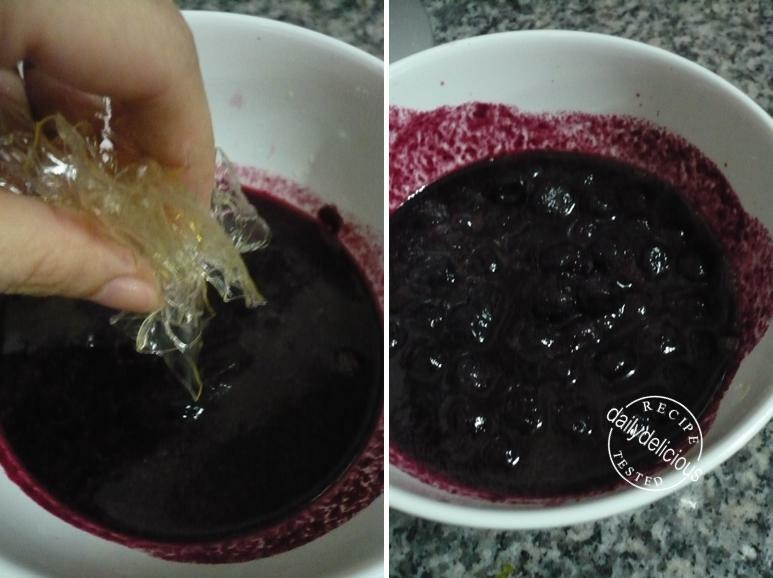 Place the sponge in the mold and sprinkle with cassis syrup and place the hardened blueberry compote inside. Cover with plastic warp and freeze until require. Beat the egg yolks with the sugar in the sauce pan, heat the milk in the microwave for 1 minute or until hot. 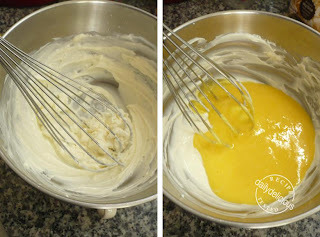 Gradually pour the milk into the yolk mixture, beat the yolk all the time. Take the pan off the heat put the gelatin into the yolk mixture and stir to combine. Beat the cream cheese until soft and free of lump, add the custard and beat to combine. Put the yogurt and lemon juice into the bowl and beat to combine. Using an electric mixer, whisk cream just to soft peaks, then gently fold 1/3 of the cream into the cream cheese mixture. 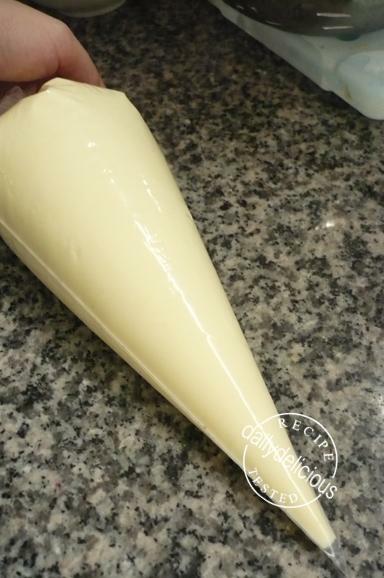 Gently fold back the cream cheese and cream mixture into the cream. Put the mixture into the piping bag. Pipe the mixture into the mold, only to cover the side of the compote. Freeze for 30 minutes, then place the berries on top of the compote and pipe the mousse to cover all the berries then level the top. Cover with plastic wrap, then refrigerate for 4 hours or overnight to firm. Take the cake out of the molds. Beat the cream with the icing sugar until soft peak form. 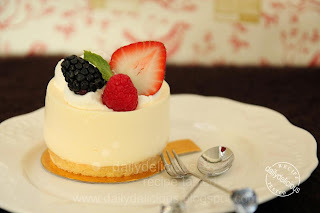 Decorate the cake with the whipped cream, place the berries and decorate with mint leaves. Blueberry cheese pie comes alive again. What an elegant taste treat. Thanks for posting! You can use this chart as a guide line for cup measurement ^^. I made this...and it was a super hit...did follow your guideline for cup measurement...Thanks. I made this with your guide line cup measurement....and it was a superhit.....Thanks for the awesome recipe!!! I'm so glad that you can make it using the guide. Your desserts all look so delicious. I have a question and hope you can help me answer it. This recipe is asking for 4 g of gelatin sheets. How much of gelatin powder would I use in place of gelatin sheets? Thanks a lot. You will use the same amount of the gelatin but soften the gelatin powder with 1tbsp of water. Hi, thank you for sharing, I will love to make this during spring break! I have 1 question, do you always use 4 cm by 2 cm silicone mold for the insert? Yes, I use 4 cm by 2 cm silicone mold.